BRAUN - Byzantium, Nunc Constantinopolis..
BRAUN,G. / HOGENBERG, F. - Byzantium, Nunc Constantinopolis..
Byzantium, Nunc Constantinopolis.. - BRAUN,G. / HOGENBERG, F.
Size : 12.8 x 18.9 inches. / 32.6 x 47.9 cm. Description :One of the finest and most sought-after views of Istanbul. Viewed from the village of Scutari, the City is shown with all its fortifications, the original Genoese district of Galata on the opposite bank of the Golden Horn to the right. European galleons and Turkish galleys fill the seas of the Bosporus and Golden Horn. 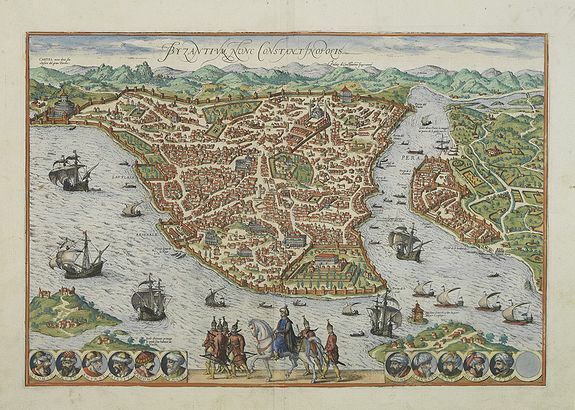 The great buildings of the 16th Century Istanbul during the reign of Suleiman the Magnificent can be clearly seen, including the Suleymaniye Mosque and the Topkapi palace. Lower centre is filled with a parading Turkish horseman and troop of janissaries. The finest feature of the print is the series of 11 (of 12) roundel portraits which adorn the lower border and depict Turkish Sultans of the 13th to 16th centuries, including Soliman the Magnificent and Selim. Condition : Some faith marginal thumbing of paper. Very good condition.